In our most recent blog, we discussed how important it is to invest in the best banners you can find for your business along the Front Range. A big part of choosing the best banner is making sure that it holds up to Colorado weather. The same is true when it comes to your outdoor business signs, whether it’s a lighted business sign on the exterior of a building or a sign that’s posted in the ground. If you already have a business sign, what can you do to make sure that it does well for another winter? Here are some tips on keeping your outdoor business signs looking good. The first step to keeping your signs looking good all winter is to purchase a quality business sign in the first place. The elements can be hard on signs year round, and a high-quality business sign is going to do a lot better than one that you got from a cheaper print shop. What can a high-quality sign provide that a lesser sign can’t? Weather the weather, of course! Properly-constructed and printed signs will be able to hold up to UV radiation, ensuring that the colors don’t fade. They’ll also be better constructed and designed in order to prevent water from getting in. After all, water can cause electrical problems in outdoor lighted signs (more on that below) and get into cracks of printed signs and freeze, causing premature cracking. You probably don’t spend much time around your signs, especially those that are hung on the storefront and well out of reach. But if you’re up there for some reason — hanging holiday lights or cleaning out old bird nests — inspect the sign to see if there are any obvious problems. If you notice missing screws that are allowing gaps in the sign, make sure you get someone to come repair it for you. Even if you’re not up on a ladder inspecting the sign, you can check parts of it by simply getting out a pair of binoculars or a camera with a good zoom. Of course, if you have a standalone sign that’s in the ground, such as a directional sign, inspecting it is easy whether it’s a lighted sign or not. Make sure that none of the hardware is coming loose and allowing water inside. If you see any gaps, get it taken care of right away. In general, people in Colorado are pretty environmentally minded and completely understand when a bird builds a nest in an outdoor lighted sign above a business. It can even draw the attention of kids, who will point and tell their parents about the bird nesting in the letters of a sign; this draws even more eyes! (Still, care should also be taken as to not allow too many letters to give birds a good place to build a nest. While a couple of birds can be quaint, a dozen pigeons flying in and out of the sign’s letter can be kinda disgusting. Avoiding such nest-building spaces can be dealt with during the design process.) But as cool as a bird on a sign can be during spring, you don’t need those nests sticking around all winter long. Nests can help water pool in places it was never meant to pool, and even if the water doesn’t get into the sign, it might freeze and cause cracking and separation. Better to clean out the nests before winter comes. Water, dirt, and insects can also get inside, and that can cause electrical problems. The best way to make sure that your lighted outdoor sign isn’t going to have problems is to get it inspected by a professional every so often. Also remember, winter contains the days of the year with the least amount of daylight, and we get even shorter days here along the foothills because the sun is being blocked by the mountains earlier. So unless you want your entire store to be invisible after 4:45 pm, it’s best to get your sign up and running again! Outdoor signs, whether above a business or buried in the ground, are supposed to be constructed to last for years. But even if you had it installed last year, there’s always something that could go wrong. For lighted signs above a business, poor installation can cause one of the letters to loosen; this could pose a danger to anyone standing underneath. Signs that are in the ground could get hit by cars or vandals, or maybe the concrete keeping them in place was poorly poured. If you see that something on your sign has come loose, call a professional immediately for sign repair. If your sign is in the ground, give it a light shake to see how it’s holding up. 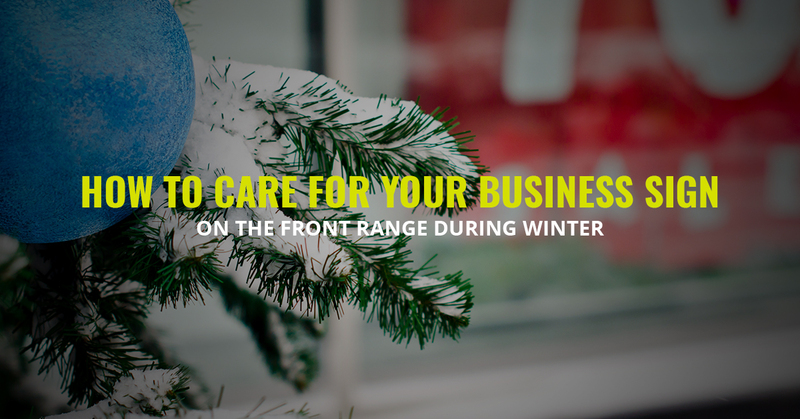 Any problems you find now will only get worse over the winter, so make sure you get them taken care of soon. As we mentioned above, a single bird building a nest in your sign probably isn’t that big a deal. But when multiple birds stick around, your sign is probably going to get pretty messy. Also, dirt and dust can also blow in, and rain can leave your signs looking speckled and dirty. Before the winter makes it impossible to put a ladder on the ground (due to the ice), make sure to give you sign a good cleaning and get rid of the dirt, bird poop, and nests (the birds aren’t using them anyway). Your sign is an important part of your company’s advertising, and you want it to look as good as possible…even if you should clean it again when spring gets here. If you’re having problems with your sign, there’s a really good chance that the sign experts at our print shop can help. And if your old sign could use an upgrade, we’ll design and install the best lighted outdoor business sign you can find in Fort Collins. Click here to take a look at some of the many signs we’ve created and hung for businesses and organization along the Front Range.